HE came, he saw and he most certainly conquered. One of Bollywood’s biggest rising stars not only set pulses racing when he removed his jacket to show off his toned torso and bulky arms, but also displayed enough vulnerability and self-deprecation to suggest he is in this game for the long run and his star quality is there for all to see. Varun Dhawan is one of Indian mainstream cinema’s fastest rising stars – he has a clutch of hit films already to his name and is well-known for the high energy, fun-loving, and lovable characters he plays, mostly. 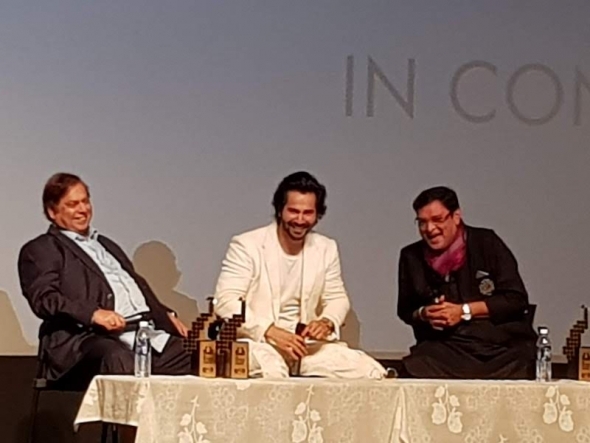 Varun didn’t quite make his 700-plus audience in the auditorium (IFFI delegates and pre-registered if you’re wondering why there were not more…) cry, but he offered them insights to his life, even talking about visiting a psychiatrist, and saying no one should feel ashamed about seeking help that way. Early on, he conceded he had other ideas about a career – saying, we think (he went into Hindi), that he even had an interview with Citigroup, a banking and finanacial services behmoth. But essentially he was drawn to cinema and at heart his motivation is to do good work and leave people with good memories when they leave the cinema. “I am not doing this for the money, everyone knows I have a succesful father,” he explained about his move to acting. However, he put himself forward for an audition to play the lead in the Kiran Rao feature ‘Dhobi Ghat’. Not a Bollywood film in the classical sense, the part eventually was played by Aamir Khan and there was a sense of relief on the part of Dhawan senior. He said: “When I learnt that he had auditioned for ‘Dhobi Ghat’, I suggested him to give up the idea and instead do ‘proper’ Bollywood cinema. Varun was naturally dispirited, but starry director and now also famed chat show host, Johar, came to cast him in his first feature, ‘Student of the Year’, after seeing him in his first ever on screen role in a short film. Varun said when he was young, he was obsessed by being an entertainer and was fascinated by stand-ups and reeled off names of a few well-known US comedians. Varun also revealed that he is very close to his brother, Rohit, who is a film director. Next up is Kalank, which is set to release on April 19. “I am really looking forward to that and seeing how you guys react…” he said, grinning. *The festival opened with the lush period drama, ‘The Aspern Papers‘ starring Jonathan Rhys Meyers, who was set to attend until the California wildfires ripped through Malibu, where he lives. Earlier in the fest, The Kapoors – Boney and daughter Jahnvi talked about legacy of Boney’s wife, Srivdevi, who died suddenly earlier this year. We will will also have some ‘bites’ from the festival talk between acclaimed indie and international actor Adil Hussain ‘What will people say‘ and ‘Life of Pi‘ and rising Bollywood star, Kriti Sanon. Stay tuned on all that by following us on Twitter and Instagram. The bird’s wings are big! The Dha-one talk took place on Sunday, November 25 at Kala Academy, Goa as part of the In Conversation series hosted at the International Film Festival of India (IFFI 49) November 20-28. See more of the talk here – want to see the whole talk (a lot in Hindi) – tell us please here on FACEBOOK!